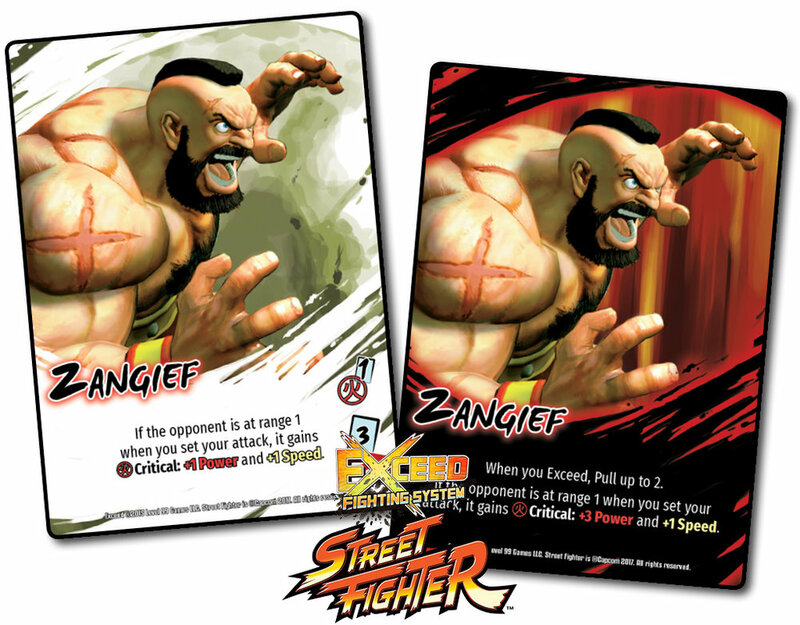 Once he gets in close, Zangief has moves that the opponent simply can't do anything to stop. The best thing to do against Zangief at close range is to walk away. Of course, this strategy only works for so long. Getting in close is the hard part, but 'Gief has plenty of tools to make this happen. One of those classic tools is the Banishing Flat (aka "Green Hand"), that deflects projectiles and moves him in close. When he's already in close, the Reach boost can be used to negate an opponent's retreat. This contributes to his high intimidation factor. Zangief's Atomic Suplex is an example of how he can threaten multiple ways at range 1. This move has excellent speed for its power, and when he engages with the Critical Trigger, it will beat an enemy Grasp due to enhanced speed. The move pushes foes away, but against a cornered enemy, there are no downsides. The Critical version chases the enemy down, which will often result in a corner trap that forces an opponent to waste tons of resources escaping Zangief's follow-up attack. For a spectacular finish, Zangief can use the Final Atomic Buster (which hits with 12 power and 6 speed, if it can be Critical-ed). Emptying both hands isn't a problem for Zangief, who can reliably follow up with a Wild Swing from the top of his deck at range 1 (and may even want to Critical the random card). I hope you've enjoyed this look at Zangief! Look out for another fighter next week! Newer PostBattleCON ONline Patch v0.19 - Iri Arrives!